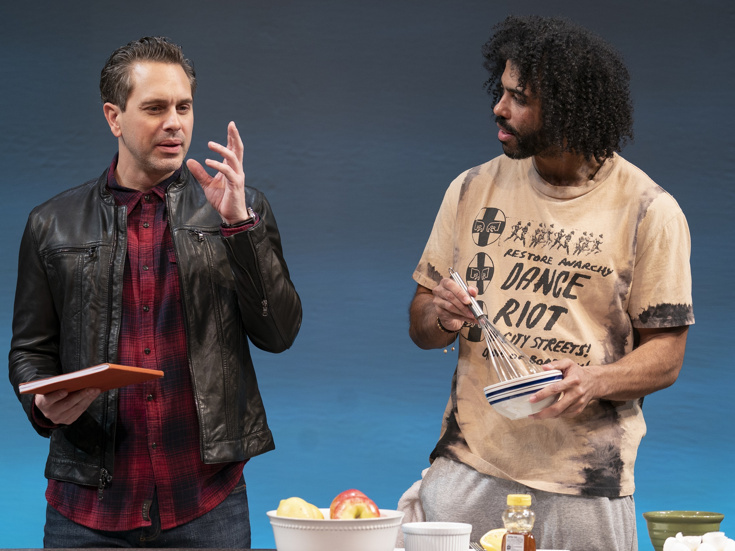 Thomas Sadoski & Daveed Diggs in "White Noise"
Off-Broadway's Public Theater has announced a second extension for Pulitzer winner Suzan-Lori Parks' world premiere play White Noise. The new work, originally announced to conclude its upcoming limited engagement on April 14 and first extended to April 21, will now end its run on May 5. Tony winner Daveed Diggs, Tony nominee Thomas Sadoski, Sheria Irving and Zoë Winters star. White Noise follows longtime friends and lovers Leo (Diggs), Misha (Irving), Ralph (Sadoski) and Dawn (Winters), who are educated, progressive, cosmopolitan and woke. When a racially motivated incident with the cops leaves Leo shaken, he decides extreme measures must be taken for self-preservation. White Noise features scenic design by Clint Ramos, costume design by Toni-Leslie James, lighting design by Xavier Pierce, sound design by Dan Moses Schreier and projection design by Lucy Mackinnon. Artistic Director Oskar Eustis directs the production, which began previews on March 5 and will open on March 20. Suzan-Lori Parks' world premiere play about race, friendship, and our rapidly unraveling social contract.